Description This time you're going to control a green monster to the exit door. 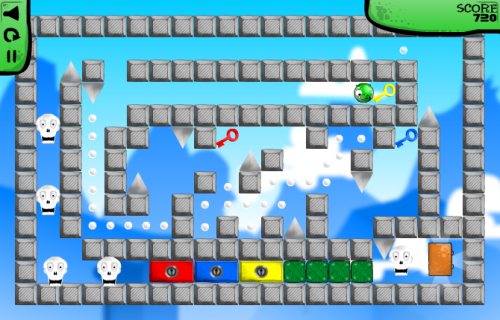 The game does represents a green little monster who discovered a secret door which lend him to a secret new world. Now with hope and courage, he's going to face dangerous skulls, trap buttons, spikes and many more obstacles in order to go back to his peaceful world. Instructions in-game and tips. White dots will increase your score by 15 points. Pause the game by pressing the 'P' key, reset the level with 'R' key. Move monster with Arrow Keys. Pause the game by pressing the 'P' key. Reset the level with 'R' key.